Faith communities are on the forefront of fights against injustices that threaten the most vulnerable populations. Faith leaders, such as Pope Francis, are taking a stance on addressing climate change as a moral responsibility to promoting the wellbeing of humanity. Parish nurses or nurses part of a faith community have the opportunity to work with clergy leaders to spread the health message of climate change and educate on how faith communities can take action on climate change. Nurses can participate in faith-based climate change networks such as Interfaith Power and Light or Blessed Tomorrow. Interfaith Power and Light is a coalition of Episcopal churches responding to global warming through the promotion of energy conservation, energy efficiency, and renewable energy. Blessed Tomorrow, a coalition of diverse religious partners committing to taking action on climate change, offers a variety of resources and tools to start making an impact in faith communities. These range from incorporating climate change in religious discussions, starting a creation care committee, hosting a climate change event, or taking climate friendly action in communities. The Catholic Health Association has been working to educate health professionals on the health impacts of climate change and the role they play in addressing climate change. Their website offers numerous reports and educational tools for health professionals and provides a variety of action items to get involved. Report by the Catholic Health Association, Climate Change and Health: Is there a Role for the Health Care Sector?, provides an overview of climate and health and how health professionals can get involved. 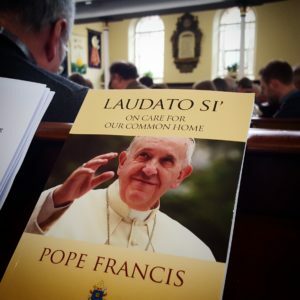 The Laudato Si by Pope Francis on care for our common home. Learn more about Green Muslims, an organization focused on inspired environmental education and action in the Muslim community. Collection of religious statements on climate change from various religious communities.